The less you spend on a car, the more you can spend on other things. This car gets up to 40 miles to the gallon. Up to 75 miles an hour. Overhead cam engine, rack and pinion steering, 4-speed synchromesh transmission, power-assisted front disc brakes, front bucket seats, radial tires, tachometer, racing mirror. All standard equipment. Oh, it doesn't have automatic transmission, air conditioning, and a 400-horsepower engine. But which would you rather have? Automatic transmission, air conditioning, and a 400-horsepower engine? Or Michelle and Tammy and Alison? The Honda Coupe. $1735. It makes a lot of sense. You know, what pisses me off the most about this one is that until I read the small print, I actually thought this ad was targeted at female car-buyers, by sending the message that if they went for a cheaper car, they could buy themselves things like ski equipment, tennis rackets, and cowboy hats. The thought of this impressed me even more when I saw the technical language being used to describe the car, making me think for a second that Honda actually gave their female customers credit for being able to understand their product. And then I got to the last line, which revealed Honda's real message that women are not only not the purchasers of vehicles, but that they themselves are the "things" to be purchased. I thought the same thing at first, but I was a little confused as to why Honda thought I might want to buy a cowgirl outfit. But then I saw the lingerie and thought I had sort of figured it out. 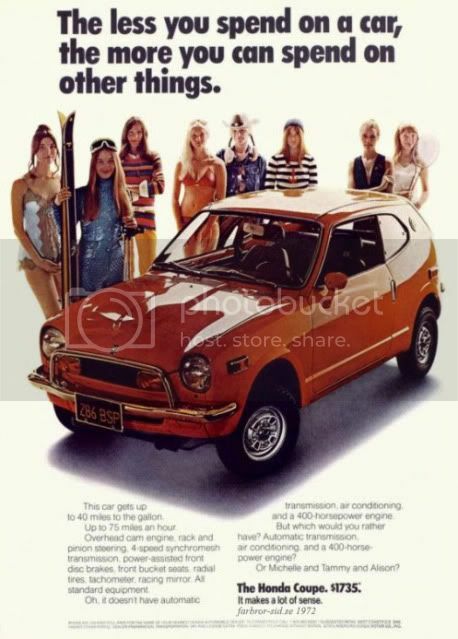 Wouldn't it be cool, though, if Honda went back and reworked that ad into a totally feminist one for, say, the Fit? Yeah, it would. Although, no automaker today could ever convince anyone to buy a car without air conditioning. Isn't it amazing that A/C used to be considered such a luxury? I drove a car without it all through college and most of the year after, but that doesn't mean I liked it. It's so scary to think of a time before your grandpa car. And a time after it. Unless you upgrade to a Caddy.